A nice desert bread! My newly invented recipe, a successful experiment. Choreg Bread for Leo, a dying friend. My friend Leo died earlier this year. He was pretty sick towards the end. Leo loved Choreg, a sort of Armenian holiday bread his mother used to make. To try to cheer him up a bit I found a recipe on the web and made up a loaf for him, the first time I'd ever made Choreg. I found the nigella seeds and mahleb on Amazon although I actually used some mahleb I bought at a middle-eastern specialty market here in town. I followed the recipe as closely as I could although I made one large braided loaf in stead of two smaller loaves as instructed. Because of the high butter content or for other reasons the strands didn't adhere to each other the way I'm used to. The bread rose well and I baked it in a steamed oven, getting a beautiful braided lof that was easier to pull apart than to slice. The mahleb gave the bread a delightful cherry-like aroma which filled the house when I baked the loaf, and later the car when I took it over to Leo's house. Everyone who tried the bread said it was lovely. The crust was particularly light and nice, and the crumb was soft and delectable. I was not fond of nigella seeds when I used them before and had actually thrown out my stash, but the nigella I got from Amazon in the proportion the recipe called for added a nice crunch without overpowering. Here are links to the ingredients I bought on Amazon: nigella seeds (http://www.amazon.com/gp/product/B000GHFRYG) and mahleb (http://www.amazon.com/gp/product/B000GHJKAS) . They both seemed to be of good quality. Leo was one of my professors when I studied engineering many years ago. Over the years I've attended many parties in his home and he's been a frequent visitor in mine. He was sorely missed at thanksgiving this year. Read more about Choreg Bread for Leo, a dying friend. I decided to use up the last of my surplus eggnog and try to improve over the recipe in my previous post. I first warmed the eggnog to around room temperature. I mixed the dry ingredients, added the eggnog, and mixed up the dough in my stand mixer. I covered the mixing bowl and let the dough rise for about half an hour, then kneaded it to get good raisin distribution, and formed it into a braided loaf. The dough wasn't very warm because I didn't want to heat up the eggnog in the microwave. Consequently the dough rose slowly. I decided to bake the loaf around midnight. 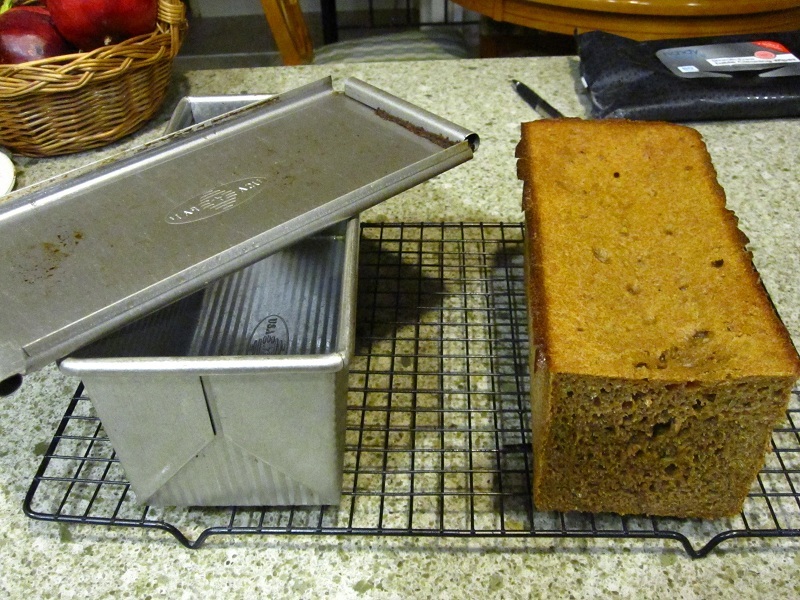 I baked at 350F for 25 minutes, adding a cup of hot water to a pan to steam the oven when the loaf went in. The icing I mixed up in a coffee cup before I baked. When the loaf came out of the oven I put it on a cooling rack and spooned icing over it. 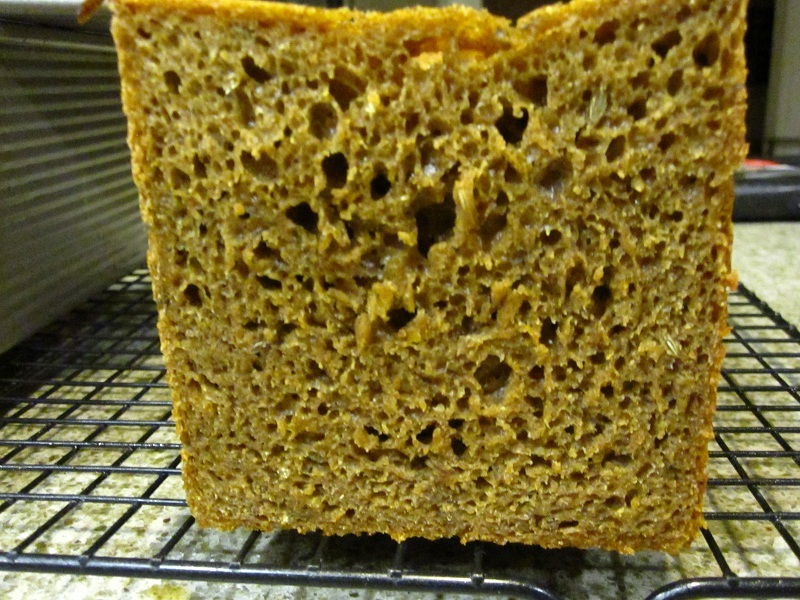 The loaf turned out rather pretty, thin crust, soft and a little dense on the inside, with a very rich flavor. The citrus in the icing was a nice complement to the slightly eggy flavor of the bread. A slice spread with cream cheese was totally decadent. A good breakfast item, or even as a dessert. The only thing wrong with this loaf is that it was a bit dense/heavy. In the future it might be a good idea to warm the eggnog in the microwave and use SAF "gold" instant yeast instead of the SAF "red" that I used to get a better, faster rise and produce a lighter, less dense crumb. Of course starting earlier in the day to allow ample rise time would be reasonable too. I had some eggnog in the fridge approaching it's ""sell by" date and nobody in the house is a big eggnog fan. I looked at the ingredients list on the bottle (milk, cream,sugar,corn syrup,skim milk,egg yolks, and a bunch of mysterious flavoring and additives). It sounded like the stuff somebody might put in sweet rolls or coffee cake. Rather than throw the eggnog out I decided to try making sweet rolls out of it. I hadn't brought the eggnog to room temperature so the dough was cold. I put the covered mixing bowl in warm water from the kitchen tap to warm up and proof. Two hours later the dough was well risen. I formed it into 6 rolls and left them on a sheet pan with a towel over them until dinner was on the table, then baked them 15 minutes at 450F which turns out to be too hot & long. They turned out very dark, almost black on the bottom. Despite being overcooked, the rolls were edible and actually quite tasty except for the singed crust. They were nice and soft inside with excellent flavor and texture. My wife and a guest agree on this. I think that with a little work this would be a very nice recipe. I'm not sure if it will work with other brands of eggnog or not. The eggnog I used seemed quite thick and flavorful. Tentatively what I need to do is work out a better baking time and temperature. My wife thinks it would make a nice braided loaf. I think it might benefit from adding some raisins and maybe a sugar glaze on top. I have some eggnog left. I'll try again tomorrow or the next day. I had a hand at making a sourdough Limpa loaf similar to something I had at a potluck recently. The Limpa I had at that party was very moist, around 50% rye, and flavored with molasses, fennel, caraway, anise and perhaps orange zest. I found a recipe that may well be the same one HERE, and followed it. I decided to bake it as a pan loaf instead of as an artisan loaf because the dough is extremely moist and (because of the high rye content) incredibly sticky. 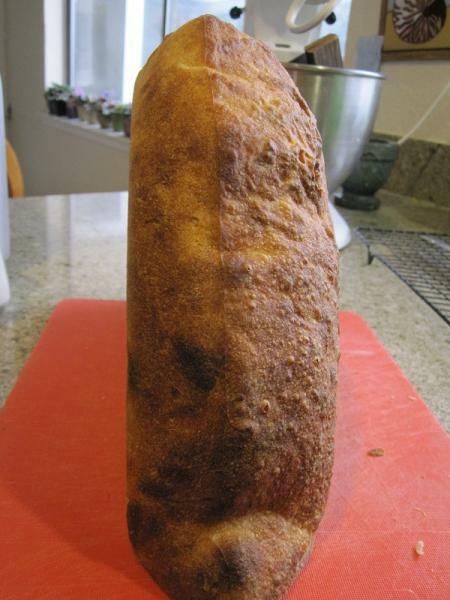 This is probably the best of several Limpa recipes I've tried. 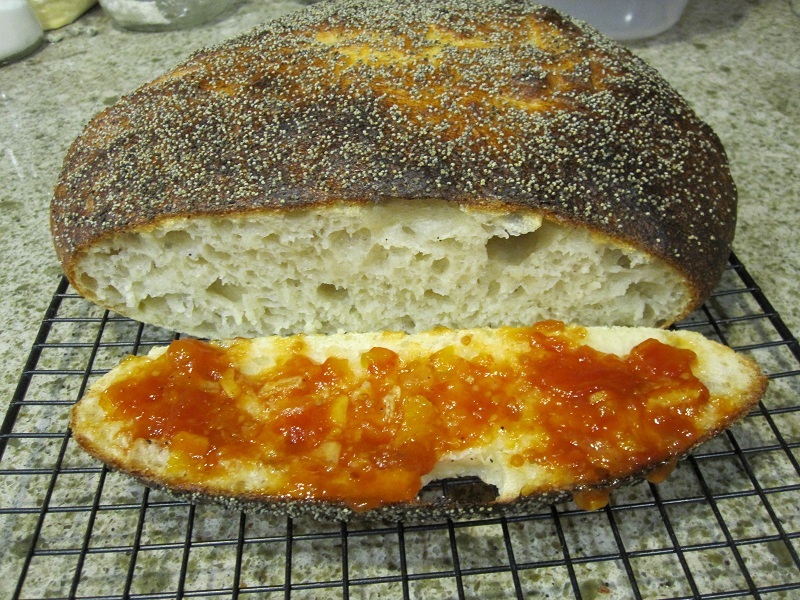 The seed mix and orange zest, coupled with the molasses and the tang of the sourdough, gives it a unique, rather festive flavor. I think it might be even better with some raisins in it but I've never heard of Limpa with raisins. Molasses(full flavor, not mild): 44 grams, 2 Tbs. After recently making spice buns using the recipe for "multipurpose sweet dough" on page 130 of Crust and Crumb by Peter Reinhart with so-so results I tried a modified version of the recipe. Others almost universally include eggs in recipes for similar doughs, but Reinhart does not. Assuming eggs might have have been inadvertantly left off Reinhart's ingredient list, I included 2 eggs (~100g) in my latest batch. This resulted in a much nicer dough, soft and kneadable where the previous by-the-book dough was so dry it wouldn't come together in the mixing bowl. 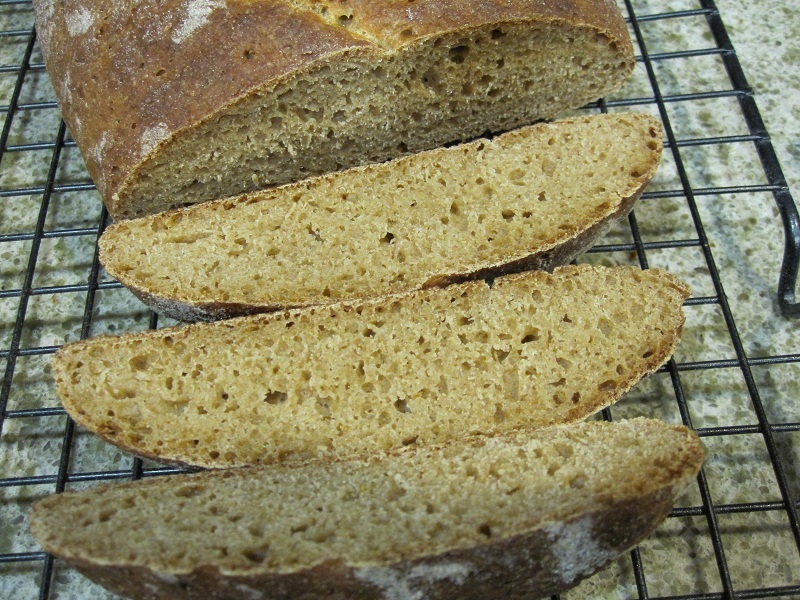 The unmodified ingredient list is in my previous post at http://www.thefreshloaf.com/node/29929/spice-buns-ala-reinharts-crust-and-crumb. 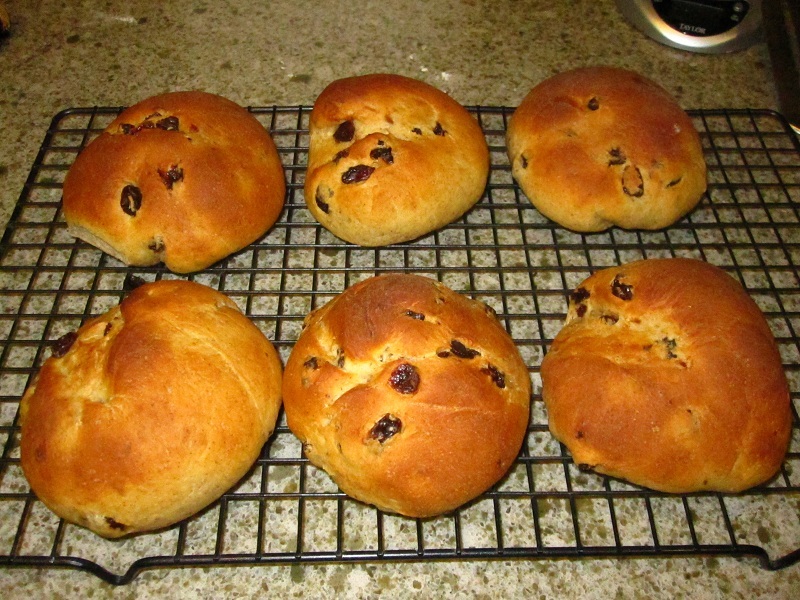 In my latest bake with the modified recipe I included 2 eggs, used a tablespoon of "mixed spice" (aka pudding spice) instead of the allspice/ginger mixture Reinhart calls for, and reduced the raisins down to 200g. I formed the dough into 9 rolls (instead of 18 as in my first trial) and let them rise a couple hours before baking for 20 minutes at 350F. 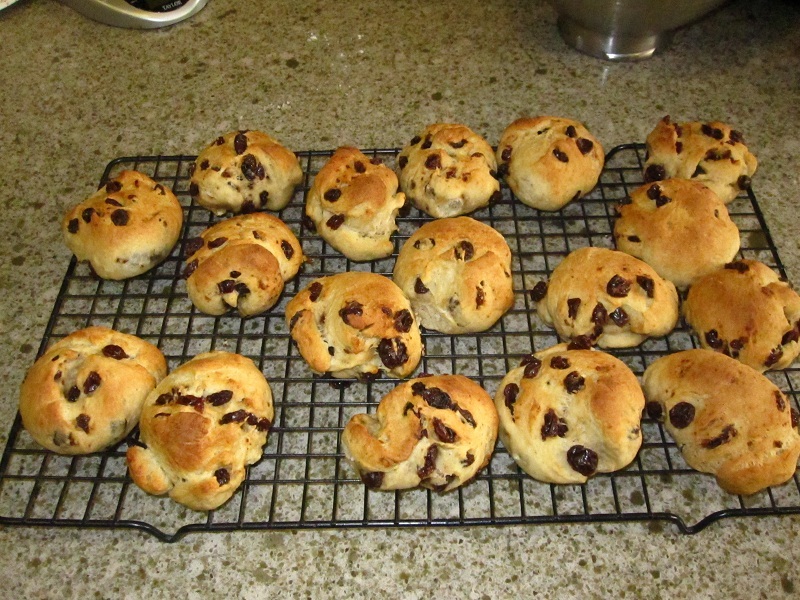 The result was very nice, and 3 of the rolls didn't survive long enough to be photographed. The crumb was very tender, more so than anything I've baked before - I really don't have a good way to describe the texture since I've never had anything similar. The crust of the was thin and slightly crispy when eaten hot. The british style "mixed spice" was more pleasing to me than the simpler allspice/ginger mix Reinhart calls for but I think using a teaspoon of it rather than a tablespoon might have been wiser. I sent Peter Reinhart an email pointing out what seems to be a typo in his recipe. Here's a photo of this latest bake. Spice Buns ala Reinhart's "Crust and Crumb"
I had a hand at making spice rolls using the recipe in Peter Reinhart's book "Crust and Crumb"
Mix all ingredients except the raisins into a dough, then knead in the raisins. Form into two-ounce balls and let rise about 90 minutes. Bake 20 minutes at 350F. I found that the dough seemed too dry to come together well so I added another slosh of buttermilk, maybe a tablespoon or two. I weighed two cups of loose raisins and measured 270g; this seems a bit excessive and 200g might be more reasonable. I popped the rolls in the oven at 350F with steam and set the timer for 20 minutes; after checking at 20 minutes I gave them another 2 minutes or so to brown up a bit. The recipe made 18 2-ounce rolls. I think next time I'll make the rolls larger, maybe 12 rolls per batch. The taste is OK: nice sweetness, moderately spicy and rather yeasty. I've that found recently that similar coffeecake recipes that called for similarly large yeast percentages also tasted yeasty to me. I'm not sure if this is due to the initial yeast added or possibly to yeast propagation fed by the sugar. I may reduce yeast by half in my next batch, to something comparable to typical bread recipes. I found the texture a bit dry and dense. The Reinhart recipe calls for surprisingly little liquid, and the results reflect this. Overall, an interesting bake but something I think perhaps I can improve on - bigger, moister, less yeasty rolls, would be nice, and perhaps some cinnamon and a pinch of cardamom. Read more about Spice Buns ala Reinhart's "Crust and Crumb"
I recently got some emmer (farro) flour from bluebirdgrainfarms.com ( link ) and have made 3 loaves with it so far. I got interested in emmer after researching biblical era bread making. This post includes photos of my most recent loaf and a recap of my experience so far with this flour. 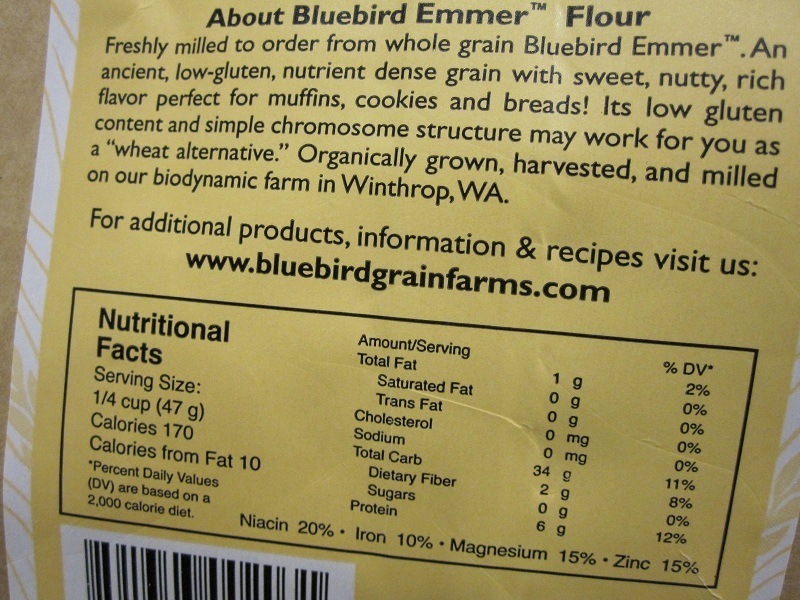 For those unfamiliar with emmer, it is an "antique" grain and genetic ancester of modern wheat. I think it was used (along with barley) in Egypt and the middle east until about the time of the Roman conquest but I wasn't there so you'll have to ask the antiquarians about exact dates. 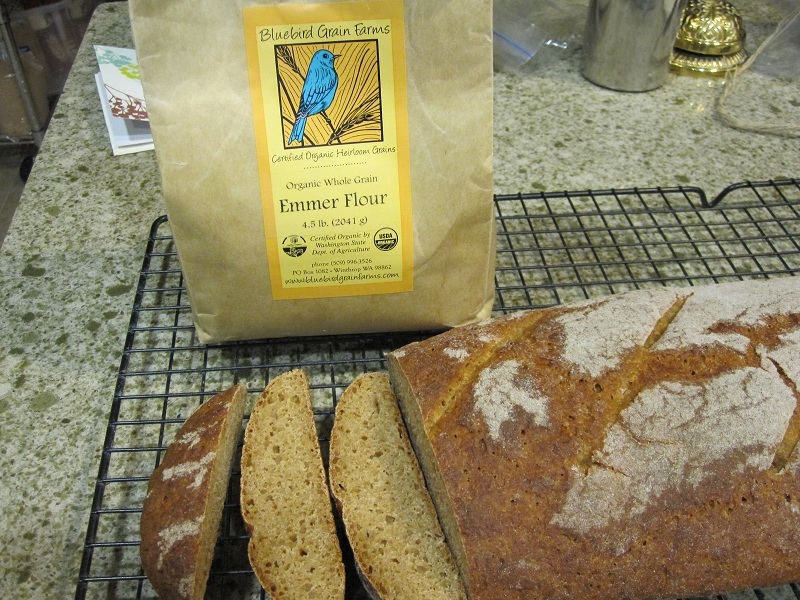 Anyway, I got curious and ordered some emmer flour from the folks at Bulubird Farms. I've made three yeasted loaves so far with the flour: (1) an artisan loaf, 60% hydration; (2) a pan loaf, 67% hydration; and (3) another artisan loaf, 67% hydration. 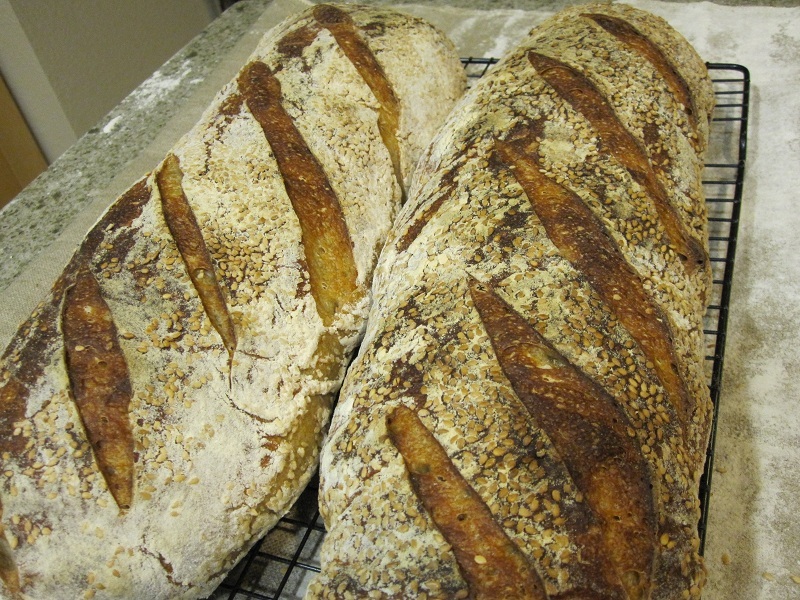 Each loaf was made using 450g flour, 0.5 tablespoon instant yeast, 0.5 tablespoon salt, and either 300g or 270g water. This is a low-gluten flour that behaves differently from my usual bread flour. Emmer dough seems stickier than dough made with King Arthur flour and doesn't seem to gain "elasticity" from kneading/mixing. Labeled protein content is almost identical to King Arthur bread flour as is labeled protein content of King Arthur All Purpose flour, which I find confusing. I think 60% hydration is better than 67% to reduce stickyness. Pan loaves should only be baked in a thoroughly greased pan. 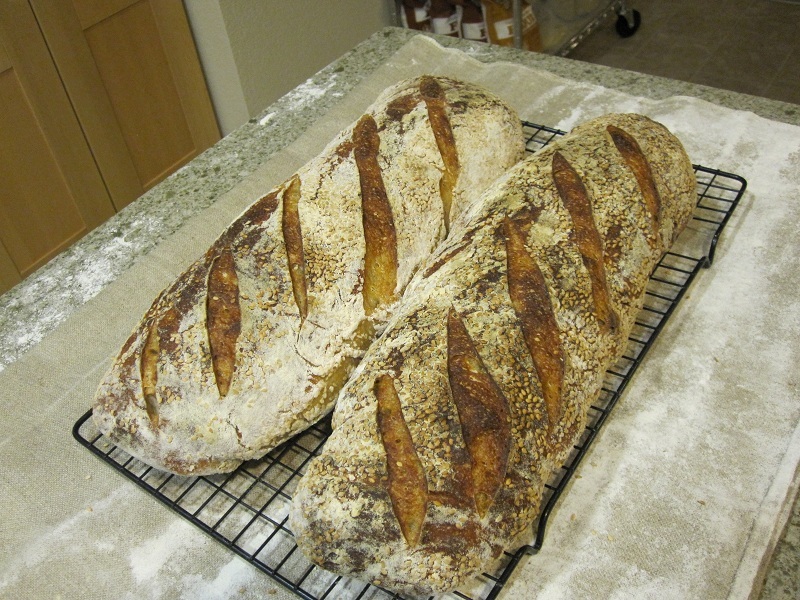 The emmer flour is a "whole grain" product that produces a crumb similar in color to regular whole wheat. The taste of the emmer bread is quite distinctive, sort of "nutty", and I find it tasty and less harsh than whole wheat bread. The emmer flour seems a little coarse and the emmer bread feels vaguely granular in my mouth. Overall I like the bread quite a bit and it might be even better with stuff in it like sugar and raisins and such. The package label has a muffin recipe that might be very nice (if I ate muffins). One drawback to this flour is the cost. Including shipping it's close to $4/pound! I recently got a $20 bakers couche from brotform.com and tried it out for the first time today. I floured it up liberally and whomped up a couple of sourdough loaves with sesame seeds for tomorrow (Thanksgiving). The loaves expanded lengthwise more than I expected as they rose in the couche so I had to sort of scrunch them a little as I maneuvered them onto my oiled baking sheet so they would fit, and they wound up with some minor "accordian pleats". A nice skin formed on the loaves as they rose in the couche and that made slashing easy as pie. Somewhere along the way the "accordion pleats" mostly went away and the loaves turned out rather pretty! I'm not really sure how to get the excess flour off without losing sesame seeds but I'll try to deal with that tomorrow. Aside from the unexpected lengthwise expansion and the excess flour problem I think I like this new couche! Any input from others on "couche techniques" would be most welcome! In recent weeks I've been kibitzing a friend who's starting up a new restaurant where he's been trying out a recently purchased, second hand, commercial "combo oven". 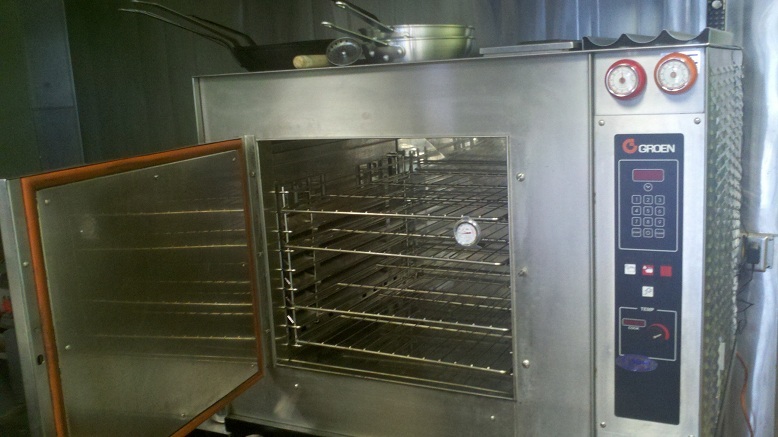 The oven is proving a bit cranky and he's working out the bugs and tinkering with bake times and temperatures. I got a chance to bake a couple test loaves in the oven and was very impressed with the "jump rise" achieved in "combo" mode (heat with superheated steam in the oven). ^test loaf from the big "combo oven"
You can clearly see how the loaf lifted itself the sheet pan when cooked in the combo oven with a lot of steam. Impressed, I tried "cooking with steam" in my home oven by dumping a cup of hot water in a pan near the bottom of the oven and slamming the door. I'd previously thought (erroneously) that this would keep the oven near the boiling point of water, but that's wrong. The oven runs near the set temperature (usually ~450F) and there's simply a lot of humidity in the oven, near saturation. Notice that the above loaf is round on the bottom as well as on the top from lifting itself off the baking sheet! In my home oven experiments I notice when I cook with steam this way I'm getting much more browning on the top of the loaf than the bottom. I'm delighted with the jump rise I get with steam, and I think I should be able to get the top and bottom more similar with some more tinkering. Now, on to shopping for and using brotforms/bannetons. A shopping report first. My friend with the new restaurant mentioned needing some inexpensive baskets for forming/proofing loaves. I did some shopping and found a big selection of inexpensive baskets at luckyclovertrading.com including three kinds of "brotform" basket and also some willow "banneton"-style baskets. They don't sell cloth liners for the brotforms. That's OK because my friend with the restaurant usually lines his proofing baskets with cloth restaurant napkin which I found cheap at another site. I ordered some brotform baskets and some napkins from the above sources. My friend with the restaurant really likes the brotform baskets and I do too. The napkins just came a few minutes ago; I like them because they have a very tight, shiny weave that should be hard for dough to stick to. My friend has used similar napkins with good success. I've had a little trouble occasionally in the past with dough sometimes sticking to custom made brotform liners. The ones I have fit very nicely but have a softer, slightly less tightly woven fabric than my new napkins. Recently it occurred to me part of the reason dough stuck to the liner sometimes I've had problems scoring loaves was I'm not used to letting a loaf "rest" on the counter until the surface dries out a bit and a skin forms. I tried doing exactly that, let the dough rest uncovered until the surface didn't feel sticky, dusted it with a little rice flour, and plopped it inverted into a lined brotform. It worked great! The dough showed zero inclination to stick coming out of the brotform, and scoring was a breeze as the "skin" on the loaf parted under the razor blade!